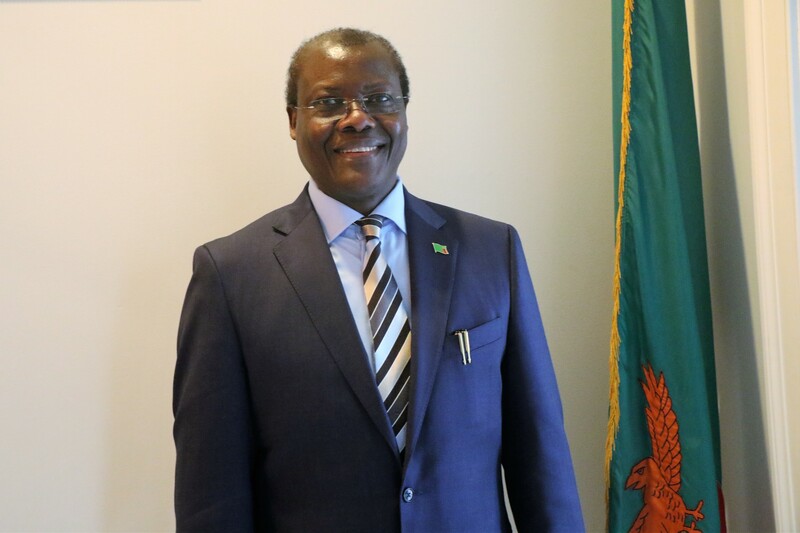 ﻿ African-American Diaspora To Host The 2018 Africa Homecoming Conference | Embassy of the Republic of Zambia in Washington, D.C.
Zambia’s Ambassador to the U.S. Dr. Ngosa Simbyakula, S.C., says Zambia supports the African Union’s stance to harness the efforts of people of African descent all over the world to invest in African countries. 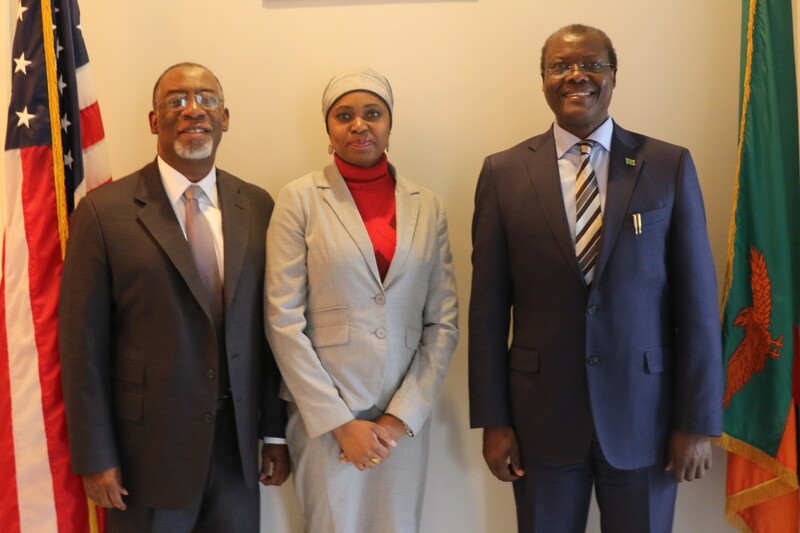 Dr. Simbyakula says the African Union diaspora division serves as the focal point and hub for implementing the decision to invite and encourage the African Diaspora to participate in the building and development of the African continent. He says the African diaspora in the U.S., therefore, serves as a catalyst for rebuilding the global African family in the service of the development and integration agenda of the continent. Dr. Simbyakula said this when Diversity Restoration Solution (DRS) President Eric Sheppard paid a courtesy call on him at the Embassy in Washington D.C. And Mr. Sheppard has announced that the African American diaspora in the U.S. have started preparations to host the 2018 Africa Homecoming joint Planning Tourism and Trade Conference to be held in the U.S. in July this year. Mr. Sheppard said the 2018 Africa Homecoming Joint Planning Tourism and Trade Conference is part of the preparations for the 400-year anniversary milestone of African descent coming to America. He said Zambia has been selected as the hub for the Global Center of restoration of the African American Diaspora in 2019 to introduce the continent of Africa to massive business tourism, economic trade, and restoration of cultural relationship with African countries. The project dubbed "2019 Africa Homecoming Project" is being spearheaded by Diversity Restoration Solution. They have since proposed to the Government of Zambia to build a multi-million dollar state-of-the-art Restoration Center headquarters for Africa in Zambia. DRS is a business tourism and international project development firm specialising in linking together the U.S. and African businesses and organisations. Mr. Sheppard says the story of the Dismal Swamp Canal, a historic slave site in the State of Carolina, in U.S. reminiscences the Baroste plains of Western Province which they want to promote under the Zambia tourism sector. “I extend a Happy New Year to the Homecoming Committee and friends in Zambia. We are looking forward to continuing the process of developing tourism and trade opportunities between us. The preparation for the Africa Homecoming Pilgrimage to Zambia in 2019 is progressing well and we have extended an invitation to Government Officials in Western Province, the Barotse Royal Establishment and Community organization representatives which I had the honor and pleasure of meeting during my visit in Zambia in June 2017. "The first slave ship which brought our ancestors from Africa in 1619 under the British Colony entered through North Carolina in America came from Angola, and I believe that it was through this route that my ancestors were taken from Western Province. The Zambian delegation will play a vital role in introducing Americans to the shared history between us and the tremendous opportunities ahead of us by developing processes for implementing mutually beneficial tourism, trade, and investment projects,” Mr. Sheppard said.